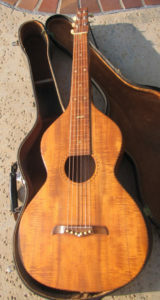 Talk and discuss everything about the weissenborn lap steel and other niche instruments! Browse through used, new, and vintage musical instruments and products! Need to Sell your Instrument? Great! Create a store on TWIE and upload your products! Please be respectful of the site and others! The Weissenborn Information Exchange is an international Hub with everything Weissenborn. Please enjoy everything this site has to offer and please respect the community and other members. Read our Forum Guidelines & Rules to get started. Browse through our Articles including Luthier and Artist Interviews.